Chikkaness Avenue: OVATION PRODUCTIONS PRESENTS JOHN FORD COLEY LIVE IN STA. ROSA! American singer John Ford Coley will be performing at the Santa Rosa Sports Coliseum is Santa Rosa, Laguna on August 11, 2018 produced by Ovation Productions. John is a classically trained pianist, guitarist, actor and author most known for his partnership in the musical duo England Dan & John Ford Coley. John is not new to Filipinos as he has frequently visited the Philippines due to the massive popularity here of England Dan & John Ford Coley music. 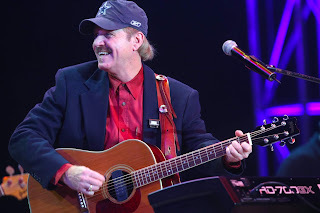 His first visit to Manila was via a three night Valentines weekend concert at the Folk Arts Theater in 2000 where he appeared with the late Jimi Jamison of Survivor, David Pack, and Ambrosia. Rupert Holmes who was initially in the bill was a no-show. Working together in Manila enabled John and Ambrosia to do more frequent appearances and collaborations together in the U.S. on many occasions. The Valentines concerts were produced by Ovation Productions who brought them back together after a few years to open for the band America at the Araneta Coliseum. At 16, Coley, along with schoolmate Dan Seals formed an acoustic act simply named England Dan & John Ford Coley. The duo was signed by A&M Records. In 1971, the two moved from Dallas, Texas to Los Angeles where they opened for numerous bands. Their first break came in 1972 with the song Simone. It became a number one hit in Japan and was popular in France. However, Simone did not fare as well in the United States, and the two were released from their contract with A&M after three albums. Two years later, they acquired another record deal from Atlantic Records and released the song I'd Really Love to See You Tonight. Overall they had four top-ten hits and two top-twenty hits. They were nominated for a Grammy Award and received triple-platinum and gold records and released eight albums; additionally, other recordings were released abroad. The duo disbanded in 1980. After the passing of England Dan (Danny Seals, brother of Jim Seals of 1970s soft rock duo Seals and Crofts), John’s solo performances have gotten more attention and have given John renewed purpose to continue performing the hits that the duo have been known for (John fondly referred to their act as ‘Mutt & Jeff’ due to their height difference). One major issue for the disbanding of England Dan and John Ford Coley was change of musical direction as England Dan wanted to pursue country music. England Dan and John Coley classic hits which John continues to perform in his solo concerts include It's Sad To Belong, Soldier In The Rain, Gone Too Far, Love Is The Answer, What's Forever For, Broken Hearted Me, I’d Really Like to See You Tonight, Nights are Forever Without You, We’ll Never Have to Say Goodbye Again, What Can I Do With this Broken Heart, Just Tell Me You Love Me. John also does great covers of The Bread’s Make It With You, Dan Fogelberg’s Longer and Leader of the Band, Dan Hill’s Sometimes When We Touch, among many others. 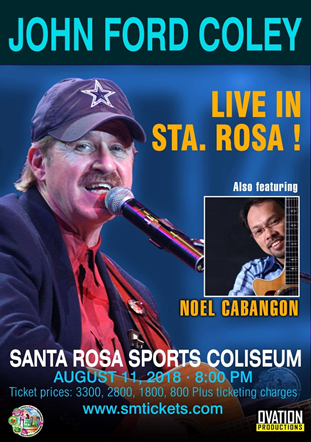 In his Santa Rosa Laguna concert, John Ford Coley will have popular OPM singer-songwriter Noel Cabangon as front act.